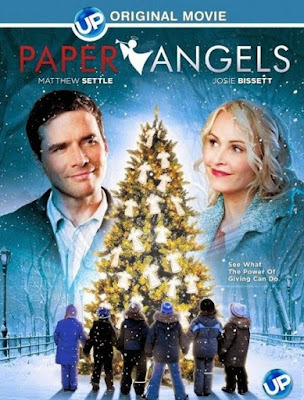 In Paper Angels, abused wife Lynn (Josie Bissett), leaves her alcoholic husband Darryl (Russell Porter), with her two kids, Thomas (Rustin Gresiuk) and Sara (Farryn Van Humbeck) and move to another town where she works as a waitress to make ends meet. In that same town, we meet Kevin (Matthew Settle), whose Marketing & Design company is on the brink of shutting down due to the economy. Plus, Kevin’s wife Jenny (Kendra Anderson) is in a difficult pregnancy with twins. Thomas starts a new school and becomes the target of a bully who is threatened by how well he plays basketball. Unable to join the high school team, Thomas goes to the community center where he meets Kevin and the two of them become unlikely friends through pickup basketball games. Little do they know the tremendous impact they will have on each others families this Christmas through The Salvation Army’s Angel Tree Program. Inspired by the hit holiday song by country star Jimmy Wayne and book by Wayne with Travis Thrasher.